A new 34.1 metre Sanlorenzo motor yacht has been sold and delivered to her American client with the buyer introduced by David Johnson at Denison Yachting. Designed by Francesco Paszkowski, the yacht was built in GRP to RINA class by Italian yard Sanlorenzo with launch in late 2017 as the 14th hull of the yard’s SD112 series. Accommodation is for up to ten guests split across five cabins, including a master suite that is situated forward on the main deck. Two VIP suites and two twins on the lower deck complete the guest layout, while the crew quarters allow for a staff of up to six people. The interior features light tones, with a modern ambience thanks to the American elm wood, used for both the walls and for the furniture. The main saloon offers two fold-down sea balconies on the port and starboard sides, providing guests with spectacular views of the surrounding scenery. Her broker adds that the new owners intend to cruise in the shallow waters of the Bahamas and Caribbean, and their new yacht will certainly fit in with their plans. She a maximum draught of two metres and a total interior volume of 266GT. Twin 1,470hp Caterpillar C32 diesel engines will give her a maximum speed of 17 knots and a range of 2,750 nautical miles at her cruising speed of 11 knots. 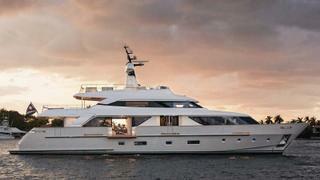 The asking price of the Sanlorenzo SD112 has been withheld.